Over the course of the past few years I have developed a taste for dusty, murky inks. Excellent colours for gloomy autumns and dark winter evenings... Two of the inks I love very much are J. Herbin’s Poussière de Lune and L’Artisan Pastellier Callifolio’s Bourgogne. Both are nice dusty purples that fit very well with the autumn season. A perfect time to do a detailed comparison, and find out which of these inks I like the most. Poussière de Lune is much more saturated and lubricated – the pen flows over the paper and leaves a very well saturated line. Bourgogne writes drier with noticeable feedback from the paper. As a result, Bourgogne leaves a finer line with less saturation. Bourgogne is a darker purple with more grey-black undertones. This is a matter of personal taste, but I definitely prefer the darker purple of Bourgogne. Both inks appeal to me. Poussière de Lune is technically the better ink for writing, but colour-wise I really consider Bourgogne to have the edge. For this round, both champions are on par with each other. Let’s call it a draw. The writing sample was done on Rhodia N°16 Notepad with 80 gsm paper. Both inks behaved flawlessly, with no feathering and no show-through or bleed-through. J. Herbin’s Poussière de Lune wrote wonderfully, with very good ink-flow, and leaving a well saturated line. In contrast, Callifolio Bourgogne is much less lubricated, and leaves a consistenly thinner line on the paper. With normal writing, the colour difference between both inks is less apparent. Although Callifolio has more grey-black undertones, in everyday writing this is not immediately obvious. You need to look carefully to see the difference. Both inks also exhibit an aesthetically pleasing shading. Being dark inks, the shading is not very prominent – from dark to darker purple – but it is there, and gives extra character to the writing. For this round, Poussière de Lune clearly has the upper hand, and showed the best technique. A clear and definite win. 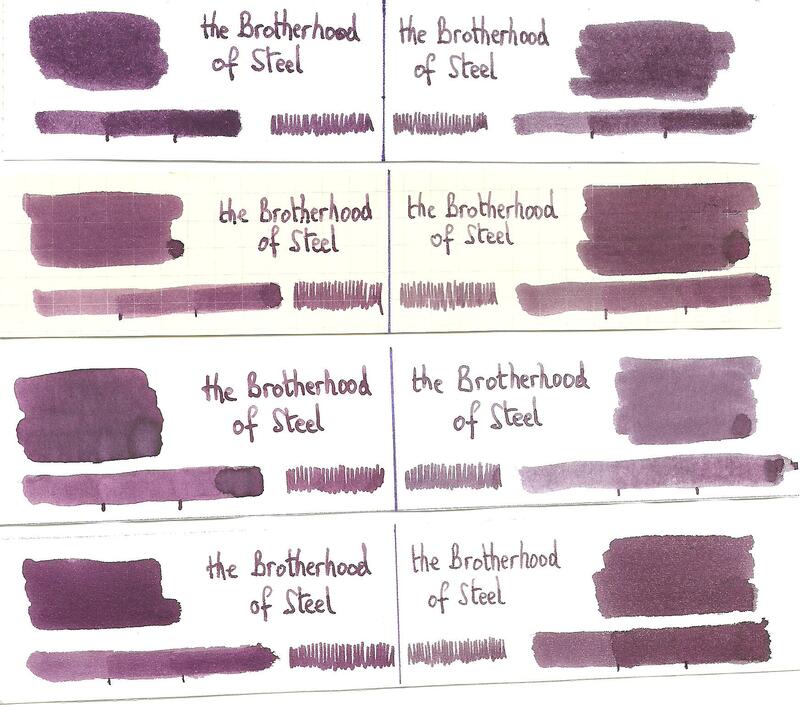 I added this round to indicate how the battling inks behave on a range of fine writing papers. From top to bottom, we have : FantasticPaper, Life Noble, Tomoe River and Original Crown Mill cotton paper. All scribbling and writing was done with a Lamy Safari M-nib. Both champions did well, with no show-through nor bleed-through. But this round is not about technicalities, it is about aesthetics and beauty. Are the fighters able to make the paper shine ? In my opinion, Callifolio Bourgogne is the more able of the champions – It’s dustier and murkier on a wider variety of paper. The only exception is with Tomoe River paper, where I like the result of Poussière de Lune better. For this round, Bourgogne gets the upper hand and gets a win on points. 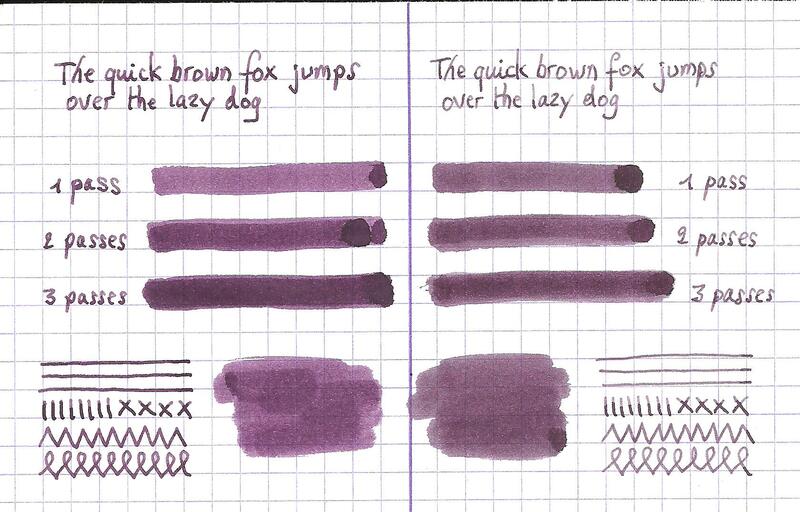 Both inks have drying times in the 15-20 second range on the Rhodia paper. Both inks also do fine on the smudge test, where a moist Q-tip cotton swab is drawn across the text lines. There is some smearing, but the text remains perfectly legible. For the droplet test, I dripped water onto the grid and let it sit there for 15 minutes, after which I removed the water droplets with a paper kitchen towel. Neither of the champions exhibits good water resistance – although with some patience you might be able to reconstruct the written word. Also Poussière de Lune leaves more of a purple mess on the page. The chromatography shows that both inks leave a greyish residue, with Poussière de Lune leaving more purple smearing. You can also see that Bourgogne is the darker of the two, with more grey-black undertones in the ink. Overall though – the chroma’s look very similar. 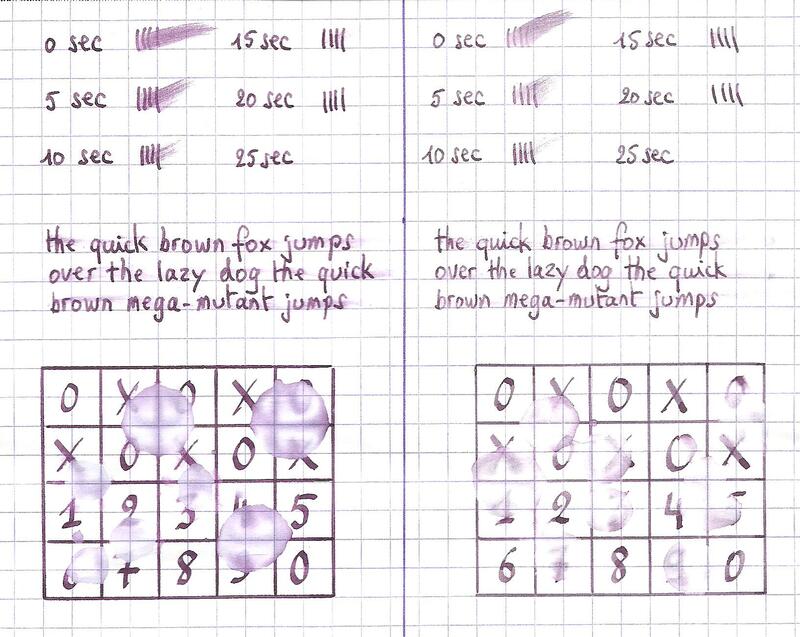 In this round, both inks show more or less the same behavior, resulting in a draw. Welcome to the final round. Here I give you a purely personal impression of both inks, where I judge which of them I like most when doing some fun stuff like doodling and drawing. Both inks do well, and the lack of water resistance allows for nice effects when using a water brush. 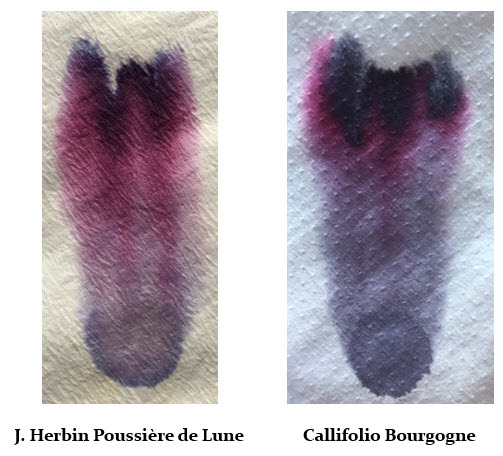 But I must admit that I like L’Artisan Pastellier Callifolio Bourgogne a lot better than J. Herbin Poussière de Lune. Bourgogne is much nicer to draw with, and has a much more pleasing dark dusty purple colour. The dark grey in this ink is what really makes it shine. In comparison, Poussière de Lune is too purple in appearance. 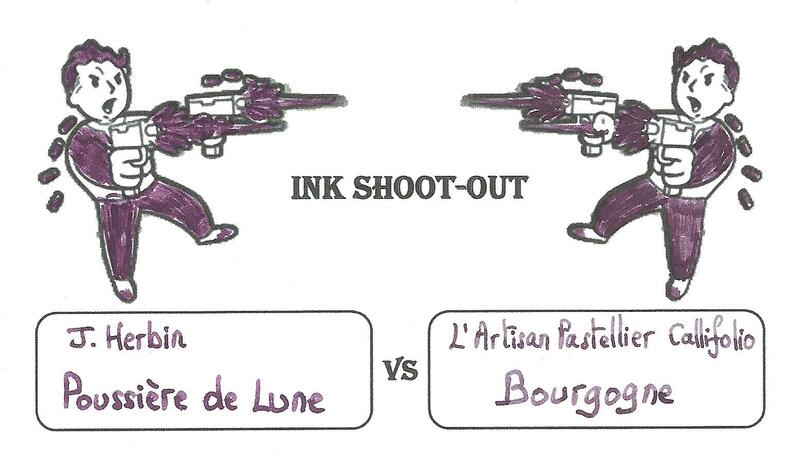 This is of course a personal decision, but it is the judge’s conclusion that this round is clearly won by the more artistic ink – Callifolio Bourgogne. Both inks find a proud place in my collection, and both are suitably gloomy inks for the dark autumn season. If you are in search of some dusty dark purples – no need to look any further. But counting the points, I find that L’Artisan Pastellier Callifolio Bourgogne has a slight edge over J. Herbin Poussière de Lune. A fight needs a winner, and in this fight I grant the victory to Callifolio Bourgogne. I love your shoot-outs. They are all wonderful. Back to the inks, I think dusty purples are never really my cup of tea... I prefer more vibrant ones. Yeah! Another ink shoot-out. It's great series, I'm always waiting to read. Here the choice is difficult. As you I enjoy both of this inks. While I agree that Poussiere de Lune is better ink in terms of behaviour and properties, I prefer murkier Bourgogne. Basically I would say if someone tends to write with dry pens, he/she should choose Poussiere de Lune. If however there's some crazy wet vintage pen or nice broad nib around Bourgogne will shine. Hmm, well, shine isn't the right for this kind of colors, but you get what I mean. PS: I wouldn't mind if you added poll to your shoot-outs It would be interesting to see how people vote. Edited by visvamitra, 23 October 2016 - 15:23. Thanks for doing this. I'm not a fan of Poussiere de Lune, but I'm not sure that I'd like Bourgogne better. I am a bit curious about comparing Poussiere de Lune to KWZI Grey Plum (my sample of Poussiere de Lune seems to have a lot less red undertone to it than what you have). Thank you for another great ink shoot-out! Thank you for this comprehensive and fun review. Informative and entertaining, thank you. In the initial gunsmith sketch, both inks looked nearly identical, but your further testing reveals the differences. I have PdL, and it seems to have more of a red component, which I prefer. I'll stick with what I have and enjoy your amusing, informative review! Love your reviews! What I learn every time is that 2 inks I expect to be the same have nuances that rise to the surface and distinguish each from the other. You are right that this kind of dusty, murky purple is perfect for fall and winter although I've never considered using one. My vote and, therefore, my purchase will be Callifolio Bourgogne because I like the grayer tones in it with less red. Great "shoot-out"! I have Bourgogne and really enjoy it. Interesting that you pitted two french ink makers together. This is wonderful! Thank you so very much! A beautiful and comprehensive shootout! Love the color, as my taste leans to the mysterious and offbeat. Wish they played better with water. Thank you for doing these. I look forward to these, and always hope for more. grumble...two more inks for the fabled list. Was that the same nib? If so Herbin is the wetter ink by far. I did think Herbin shaded better so would be first for me. I have both of these inks, and my Bourgogne is more of a wine color than PdL. The purple is what I love about PdL, so it's my winner. Edited by Aquaria, 03 September 2018 - 19:56.